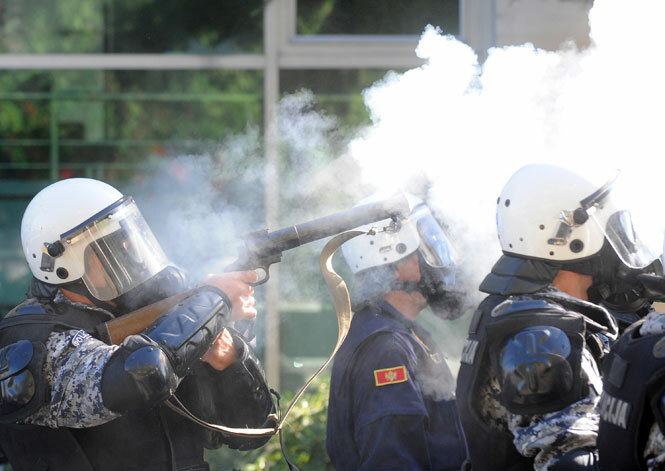 A Montenegro police officer fires tear gas, during a gay pride march, in Podgorica, Montenegro, Sunday, Oct. 20, 2013. Police have used tear gas against dozens of rock-throwing opponents of a gay pride march in Montenegro. PODGORICA, Montenegro — Police in Montenegro fired tear gas to repel anti-gay extremists who threw rocks and firebombs at officers protecting a gay pride march Sunday, officials said. About 60 people were injured. 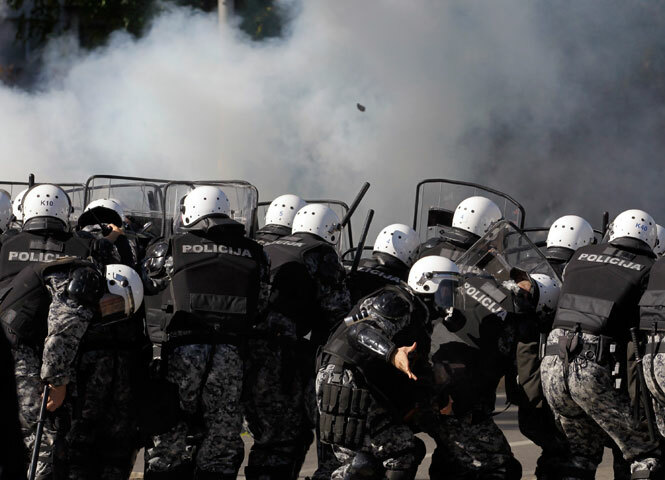 The violence occurred when the attackers tried to push through hundreds of police to reach those taking part in the march in Podgorica, the capital of the staunchly conservative Balkan country. After the march, the gay rights demonstrators were evacuated to a safe location in police vehicles. 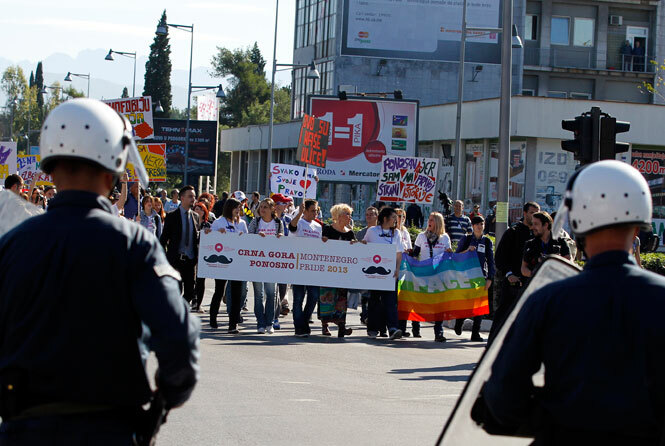 Members of the Montenegrian gay community march down a street in Podgorica, Montenegro, Sunday, Oct. 20, 2013, before their event was interrupted by dozens of rock-throwing opponents. 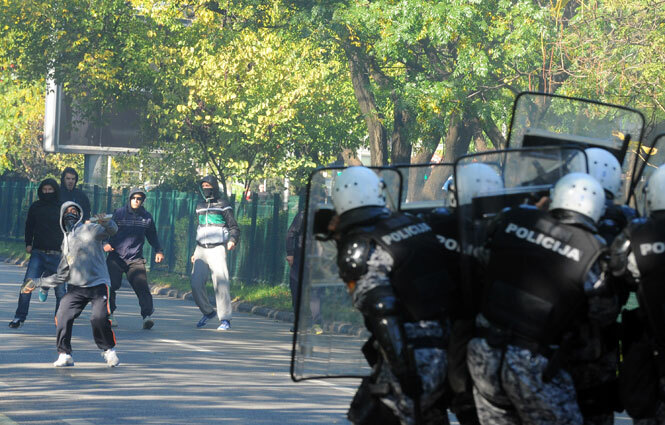 Protesters throw stones at the members of the riot police in Podgorica, Montenegro, Sunday, Oct. 20, 2013. Montenegro police officers use their shields for cover during a gay pride march, in Podgorica, Montenegro, Oct. 20, 2013. Police said about 20 of the injured during the clashes were officers, and the remaining 40 were from “hooligan groups.” About 60 of around 1,500 extremists who took part in the riots were arrested, police said. March organizer Danijel Kalezic said the police protection allowed about 150 gay activists to walk peacefully through the city. Such pride marches are seen as a test of Montenegro’s commitment to human rights as it seeks to join the European Union. Gay rights opponents attacked a similar march in July in the coastal town of Budva.